(PI: Yan Dong, Neuroscience, Pitt). This project explores how synaptic transmission from basolateral amygdala (BLA) to the nucleus accumbens (NAc) is re-organized upon cocaine exposure. The hypothesis, based on earlier observations made by the Dong laboratory, is that nascent silent synapses are generated within the BLA-to-Nac afferent following cocaine self-administration. These contain NMDA-type glutamate receptors (NMDARs), but lack AMPA receptors (AMPARs) – essential mediators of glutamatergic signaling – on the surface of postsynaptic cells, and as such they are inactive (or immature). Maturation of these synapses into functional state (upon recruitment of AMPARs to postsynaptic cell membrane) is proposed by the Dong lab to contribute to cue-induced cocaine seeking. This hypothesis is now being tested by manipulation of key proteins for axonal growth/synaptogenesis and examining the effect of these manipulations on the attenuation of cocaine seeking. This project will benefit from research support activities conducted in Cores B and A. As will be described in more detail below, the Bahar laboratory (Core B) is currently examining the functional dynamics of the family of ionotropic glutamate receptors (iGluRs), including NMDARs, AMPARs and kainate receptors, in collaboration with the lab of Dr. Ingo Greger at the MRC, Cambridge,UK with the objective of gaining a mechanistic understanding of the glutamatergic-signaling-mediation role of AMPARs. Another ongoing study is the discovery of ligands that can efficiently bind and modulate the activities of AMPARs and NMDARs. 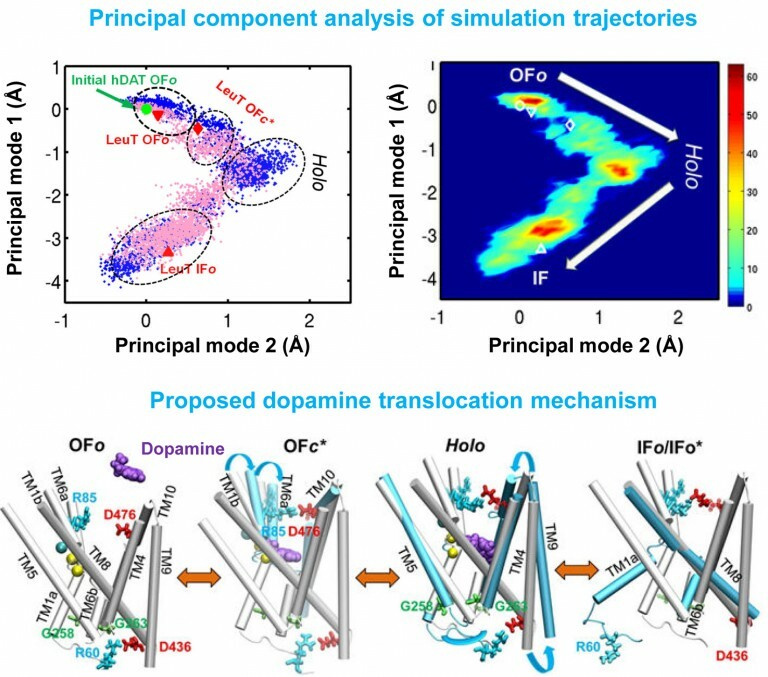 The molecular biology and electrophysiology experiments currently carried out in the Dong lab will be interpreted using the progress made in the joint computational and crystallographic studies of the Bahar and Greger labs. Furthermore, several molecular substrates are being characterized in this FRP, to be possibly targeted experimentally and clinically for attenuating cocaine relapse. These will be more effectively selected/optimized with the help of the computational methods developed and made accessible by Cores A and B. While Core B will focus on substrate proteins, using recently developed network pharmacology tools, Core A will focus on small molecular kinase chemical inhibitors to study the roles of the kinases involved in DA pathways. To do this, TargetHunter and HTDocking algorithms will be applied to polydrug addiction studies for identifying chemical probes (e.g., from approved or investigational drugs and other chemical libraries). These will be used to interfere with selected kinases and to examine their effects on the attenuation of cocaine relapse.